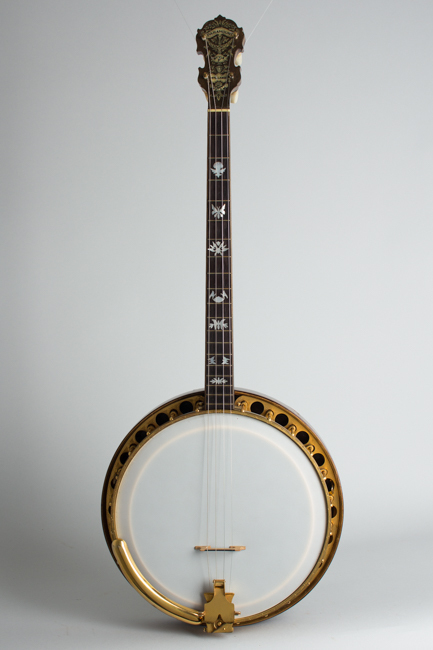 Paramount Style F Model Tenor Banjo (1926), made in New York City, serial # 6189, natural varnish finish, Indian rosewood resonator, rim and neck, original black hard shell case. 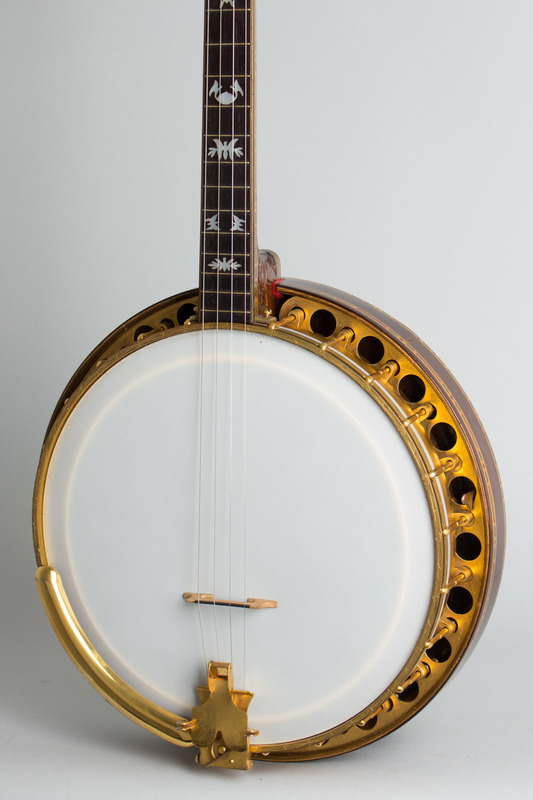 This is a fantastic and beautiful original example of the very fancy Paramount Style F tenor banjo, the original highest grade model in William Lange's professional banjo line. 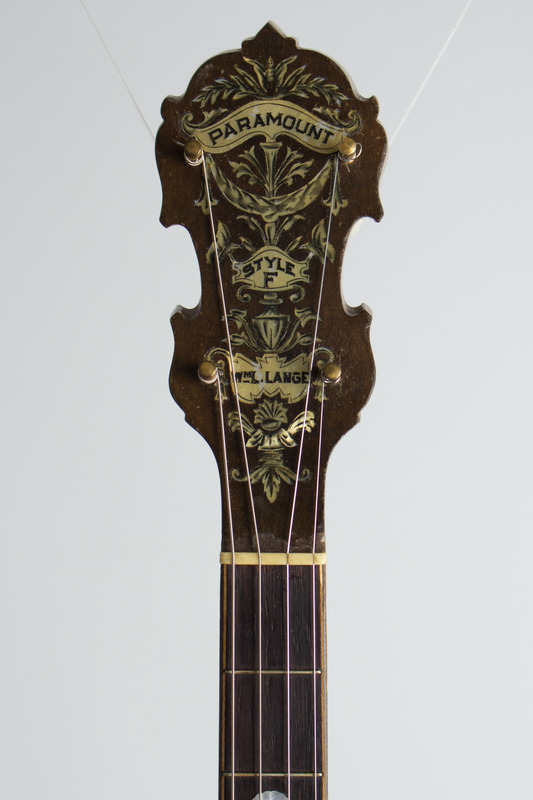 The Style E was originally Paramount's fanciest and most attractive instrument, and also embodied Lange's theory that rosewood was the "positively the finest material for tone". 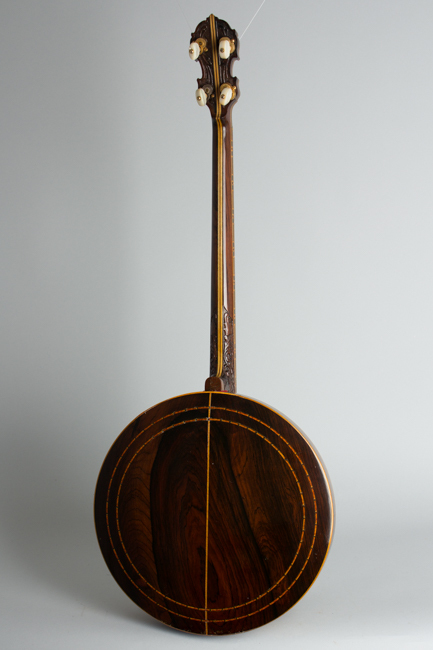 The neck, rim and resonator of this banjo are all made of Indian rosewood (which, incidentally, William Lange preferred to the Brazilian variety) nuch of it with an amazing swirling grain pattern. 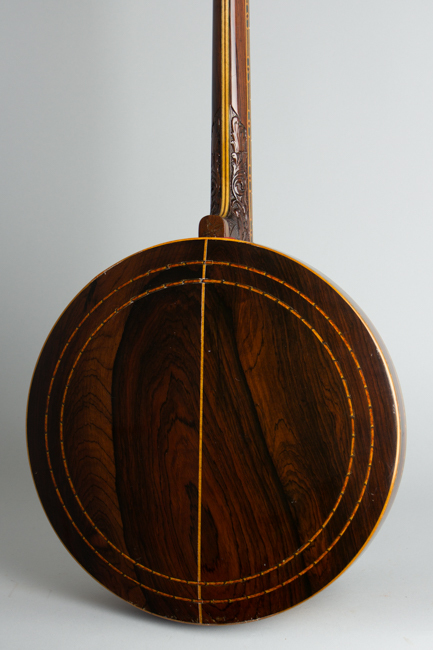 The resonator back is not laminated-it is made of two substantial solid slabs of bookmatched rosewood! The Style E sold originally for $350 -- at the time a Ford model T automobile cost $260 -- and thus was affordable only to the most serious professional users. Every surface is richly decorated with elaborate colored wood marquetry and laminated underlay, with the dark natural finished rosewood setting off the chain pattern wood edging, wood binding, and brightly colored marquetry inlay. All metal parts are "quadruple" gold plated and elaborately hand engraved. The multilaminate rosewood neck with colored wood center strips has a fully carved heel, carved peghead back and multilayered wood marquetry trim and binding. 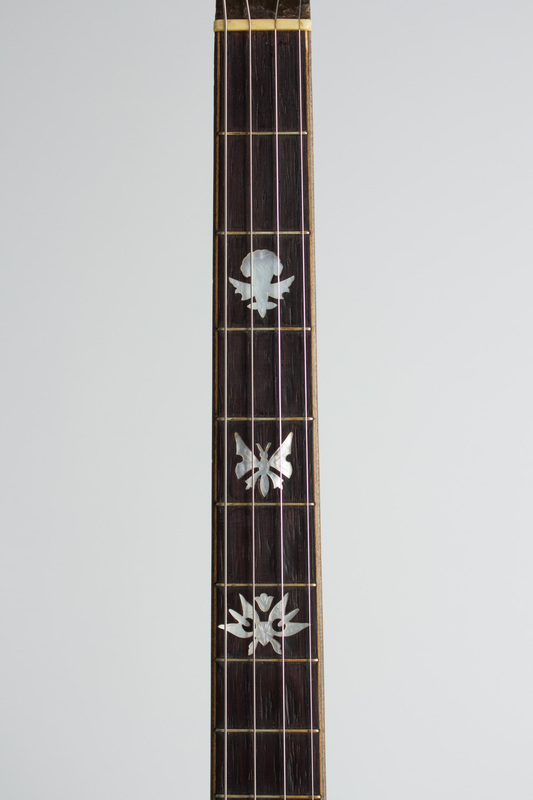 The headstock face and fingerboard have extremely fancy engraved pearl inlay. The fragile original gold-plated Page tuners with genuine pearl buttons are intact and functional, except one has a replaced outer casing. This banjo dates to around 1926 but it appears to have gone back to the factory for a hardware upgrade around 1929-30 as it has a couple of newer features. 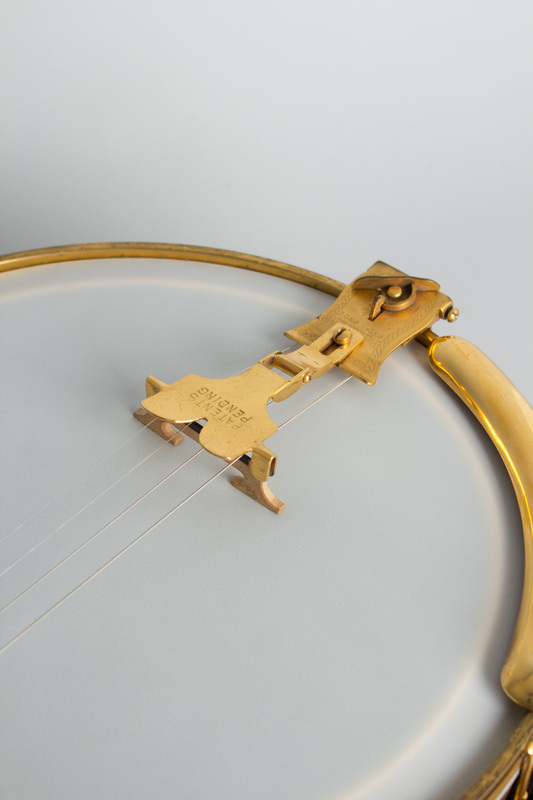 The neck adjustor at the base of the fingerboard is standard on later banjos, and actually works quite well. The gold-plated Paramount adjustable tailpiece has a flip-down mute assembley that was also was added as a stock fitting around 1930. 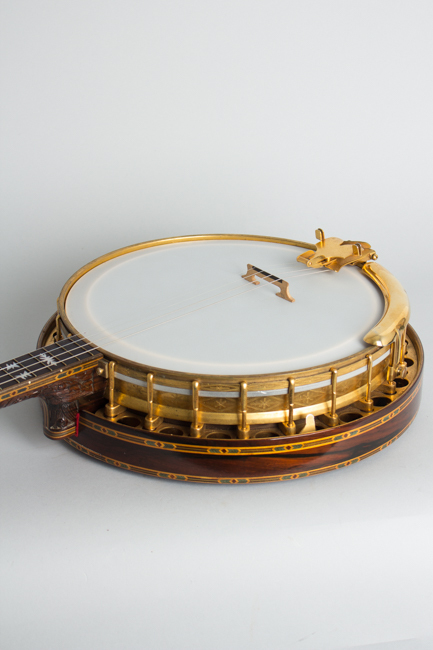 Paramount banjos were the most important instruments of their day, which introduced the salient features of the modern resonator banjo to the world. These instruments were the firm favorite with professional jazz musicians in the 1920's and are frequently seen in period photographs, especially with the pioneering African-American Jazz Orchestras of the period. The Style F represents the apex of this opulent tenor banjo era; an extremely fancy top-grade professional Tenor Banjo from the instrument's heyday, and as fine an "orchestra banjo" as there has ever been. Overall length is 33 3/4 in. (85.7 cm. ), 11 1/8 in. (28.3 cm.) diameter head, and 3 1/8 in. (7.9 cm.) in depth, measured at side of rim. Scale length is 23 in. (584 mm.). Width of nut is 1 1/8 in. (29 mm.). This banjo remains in very fine original condition, showing only minor wear overall and no alterations. The finish has only some light playwear and checking, and no notable areas of loss except a small inexplicable area just above the nut. 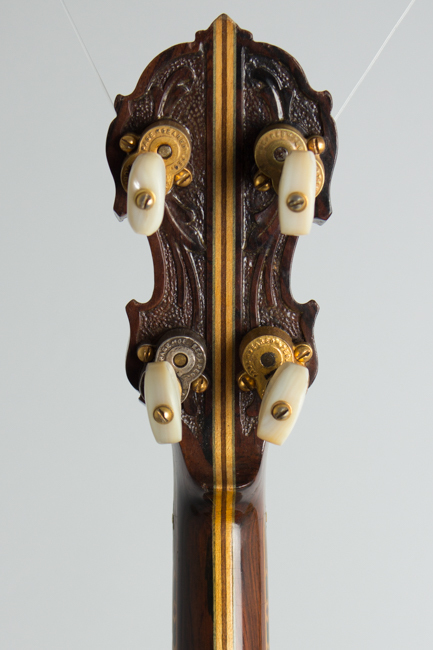 Even the oft-flaking clear lacquer over the engraved pearl on the headstock face is completely intact. The heavy gold plating has a lovely deep amber patina, also with only some very small areas of loss and minor discoloration in spots. All hardware is complete and original except one of the very fragile Page tuner housings has been replaced with an original but not gold-plated casing. The typically very thin original Paramount frets are intact with very little wear. The fine engraving on the fingerboard inlays appears to have originally been very lightly done-it is rubbed off all but the 5th and 7th fret positions despite the banjo showing little evidence of heavy use. This is quite the finest example of a high-grade Paramount we have ever had, and plays and sounds exactly as it should. It is set up with a modern plastic head but still has an original Paramount bridge. This is a truly stunning and splendid 1920's piece of tenor banjo art, and a great piece of New York Jazz age history. Excellent Condition.